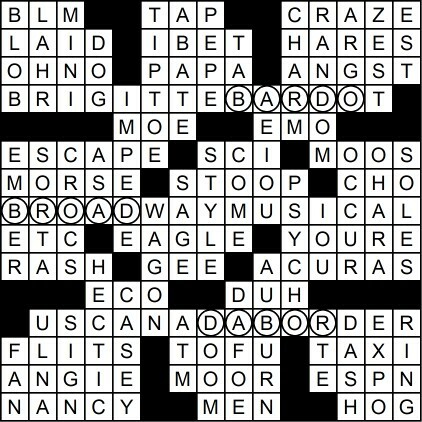 Anagrams are a classic form of wordplay, and this puzzle features 3 arrangements of the word BOARD, signified by circles in the grid. It was surprisingly hard to find decent entries, but I was pleased that one of them could be about Broadway since I’m finishing up writing my Broadway Puzzlefest this week. It’s available for pre-order now, if you want it the moment it comes out. Always nice to put a fresh entry at 1-Across, I think, instead of a word we’ve all seen a million times. The problem with using an acronym, though, is that if you don’t know it, filling in the letters isn’t going to help you learn what it is. Luckily, our friend Google is readily available, nowadays. ULNA is a little tricky for this venue, but as long as it isn’t crossed by anything too tough I think it’s okay. I had trouble finding a clean fill for the south-central area, so I added a cheater square (a black square that doesn’t affect the word count) and got lucky that the symmetrically opposite spot had an S in it (TAPS/STAB).